The trade war that has broken out has confused mainstream macroeconomics. The majority still see tariff increases as ‘protectionism’ and ‘free trade’ as the only way to operate. Trump’s measures are generally condemned. But among the Keynesians, there is confusion and split. Martin Wolf, the Keynesian economic journalist, who writes for the FT, reckoned that the trade war would be costly for global capital: “Global co-operation would surely be shattered” Nevertheless, he argued for UK retaliation against Trump’s measures “more because the alternative looks weak than in the belief that it would work. Another thing the rest of the world should do is to strengthen their co-operation.” On the other hand, he thought Trump’s wild proposal to create tariff-free area (for rich countries only) could be taken up. “Who knows? It might even work.” He did not explain how cutting tariffs on goods from the 3-4% (that they average now for most advanced countries) to zero would make any difference. Baker claims that trade deficits lose jobs because it reduces “demand” and so reducing the US trade deficit would save jobs. He makes this argument when the official unemployment rate in the US, the UK and Japan is at an all-time low (yes, I know many are crap jobs)! Apparently, if everybody ran a trade surplus (impossible by the way) all would be better off. What he really means is Trump is right to turn the US trade deficit into a surplus and get manufacturing jobs back from the developing world and Europe. It is certainly a weird and confused argument for nationalism. The Keynesians are confused about whether they favour ‘free trade’ or protectionist/nationalist measures. That echoes that confusion that Keynes had during the last Great Depression of the 1930s. He changed his mind from a strong free trader in the late 1920s to a protectionist and advocate of tariffs by the mid-1930s. This changing view was really an expression of the changing view of British capitalism. Free trade is fine for those winning in markets; protectionism is better when a national capital loses share. And that was Britain’s position. He advocated tariffs on imports into the UK as an alternative way of cutting real wages (by increased import prices) and to boost domestic production. For Keynes, it was a way for British capital to gain a cost advantage over its rivals by reducing wage costs in real terms. “I am frightfully afraid of protection as a long-term policy,” he testified to a UK parliamentary commission, “but we cannot afford always to take long views . . . the question, in my opinion, is how far I am prepared to risk long-period disadvantages in order to get some help to the immediate position.” Of course, once capitalism globally had recovered and, with it British capital, then ‘free trade’ could be renewed. The current confusion in macroeconomics and particularly among modern Keynesians mirrors the changing views of Keynes as the current Long Depression lingers and ‘globalisation’ fails for all. So now we have Keynesians like Rodrik and Baker supporting tariffs on US imports and pushing for trade surpluses, while calling on Europe and China not to retaliate! And Wolf calls for retaliation by Europe and Asia. What is the Marxist view? Should we support tariffs and other protectionist measures introduced by weaker capitalist nations to ‘stand up’ to Trump’s measures (Wolf)? Alternatively should we support Trump’s measures as a way of saving US manufacturing jobs (Baker) and perhaps helping other countries to boost their domestic industries (Rodrik)? Free trade or protection? I outlined my answer in a previous post. Free trade has been no great capitalist success. Capitalism does not tend to equilibrium in the process of accumulation. As Adam Smith put it, in contrast to Ricardo, “When a rich man and a poor man deal with one another, both of them will increase their riches, if they deal prudently, but the rich man’s stock will increase in a greater proportion than the poor man’s. In like manner, when a rich and a poor nation engage in trade the rich nation will have the greatest advantage, and therefore the prohibition of this commerce is most hurtful to it of the two”. Capitalism does not grow globally in a smooth and balanced way, but in what Marxists have called ‘uneven and combined development’. Those firms and countries with better technological advances will gain at the expense of those who are behind the curve and there will be no equalisation. Free trade works for national capitalist states when the profitability of capital is rising (as it was from the 1980s to 2000) and everybody can gain from a larger cake (if in differing proportions). Then globalisation appears very attractive. The strongest capitalist economy (technologically and thus competitively in price per unit terms) will be the strongest advocate of ‘free trade’, as Britain was from 1850-1870; and the US was from 1945-2000. Then globalisation was the mantra of the US and its international agencies, the World Bank, the OECD and the IMF. But if profitability starts to fall consistently, then ‘free trade’ loses its glamour, especially for the weaker capitalist economies as the profit cake stops getting large. Marx and Engels recognised that ‘free trade’ could drive capital accumulation globally and so expand economies, as has happened in the last 170 years. But they also saw (as is the dual nature of capitalist accumulation) the other side: rising inequality, a permanently floating ‘reserve army’ of unemployed and increased exploitation of labour in the weaker economies. 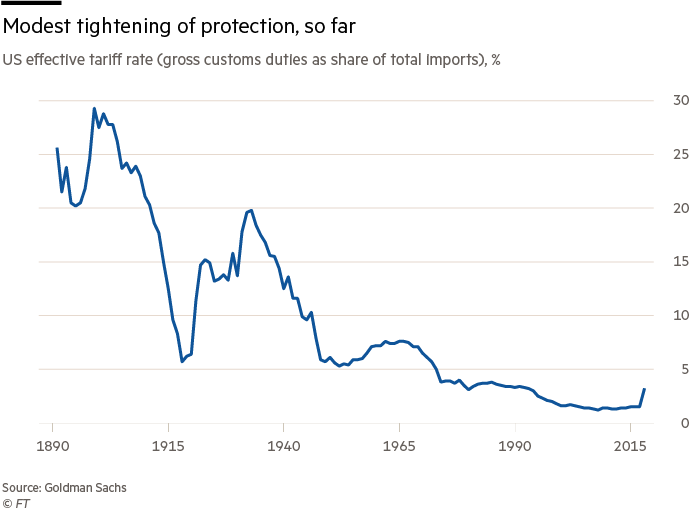 And so they recognised that rising industrial capitalist nations could probably only succeed through protecting their industries with tariffs and controls and even state support (China is an extreme example of that). But it is informative to see the Keynesians split over favouring free trade for global capital (Krugman) or protection for national capitals (Rodrik and Baker for the US and Wolf for the UK and Europe). Sign of the times. This entry was posted on July 11, 2018 at 11:49 am and is filed under capitalism, economics, marxism. You can follow any responses to this entry through the RSS 2.0 feed. You can leave a response, or trackback from your own site. If one takes the role of Empire, global reserve currency, the rise of transnationals, the collapse of unilateralism and speaks in pure black and white terminology vis a vis capital, ie does protectionism work or does free trade, then you will never get an answer. Economics isn’t separate to politics but a component part of it. For America to try to stabilise it has to blow up the planet. De-globalisation is now the order of the day. How far they get is contingent on a variety of factors. The response of others for one. None of this answers to the question of cross-border investments and complicated value chains, which Trump completely ignores. The basic Marxist argument was that capitalism in the shape of the strongest powers pressed for free trade in order to expand (as has also happened after the Second World War). Smaller more undeveloped countries would tend to want protection but would be forced by the stronger party to open up (think imperialism). Vis-a-vis Africa this is happening now. The EPAs force mutual free trade in services in addition to goods, which will be to the disadvantage of the home grown. But I do not see any answer in Marxist literature to the point when the most developed capitalist nations are losing because of their own exploits of cheap labour elsewhere. 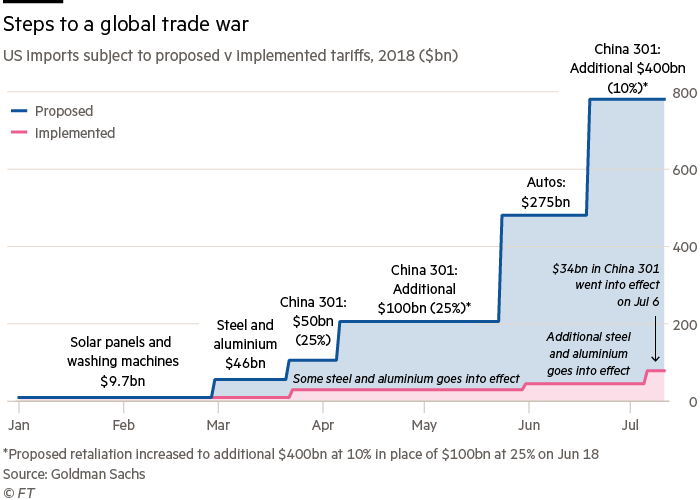 The contours of the trade war are becoming clearer. Unlike the first two world wars centred on Europe and Empire, this time Europe will sit on the sidelines, just as the US did before, while China and the US slug it out. This makes Trump’s NATO trumpeting rather ironic. Of course this little old island with its special relation and soon to be slightly detached from Europe, will be sucked into the US vortex. Think it’s going to be a bit more complicated than that, what with the ongoing devolution of the EU, the undermining of the WTO, etc. Trump represents the arsonist wing of capital, burning down the houses, whole neighborhoods, for the insurance money, and spinning off gated communities in the process, if you get the analogy. Europe is not going to be on the sidelines if Trump puts the tariffs on automobiles. Capitalism in this century is still an automobile-centric mode of production.